Buck Island Reef National Monument lies one and a half miles north of St. Croix, Virgin Islands, in the Caribbean. This magnificent coral ecosystem is under protection as a National Monument and serves as a Marine Protected Area. Corals, which only thrive in a narrow range of conditions, are slow growing and vulnerable to changes in their marine environment, including pollution, sedimentation, and warming ocean temperatures. Over the past few decades the marine environment of Buck Island Reef has been significantly threatened by these stressors, along with disease, hurricanes, and overfishing. Biologists see the plight of corals as a signal that our planet may be in danger. 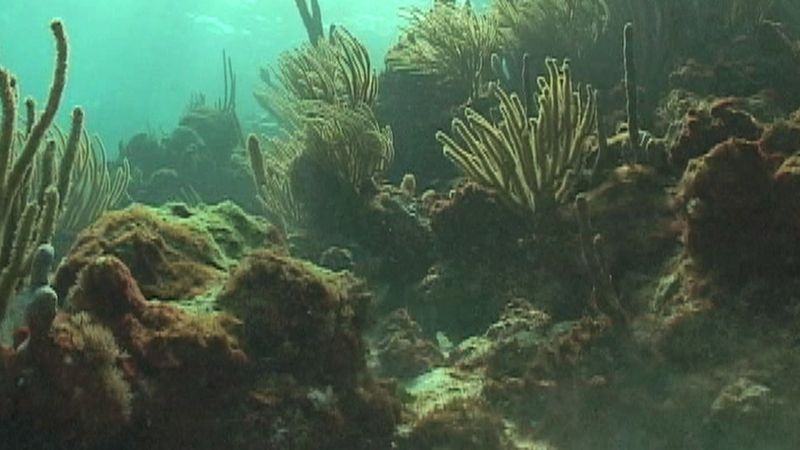 In 1998, the Coral Reef Task Force was formed to lead U.S. efforts to protect and preserve coral reef ecosystems. Under this initiative, NOAA and the National Park Service are creating a geo-referenced coral reef base map to better understand coral reef dynamics and processes. Specialized NOAA and Park Service divers conduct shallow water fish counts and habitat surveys throughout Buck Island Reef National Monument. By combining the data collected in the field with habitat maps and bathymetric models, the team is able to model and map species and fish community information. These maps help scientists assess, monitor, and inventory the health of Buck Island’s marine ecosystem, and provide decision makers with a more comprehensive overview of marine resources. When mapping in deeper waters, scientists use the advanced equipment aboard the NOAA ship Nancy Foster. These tools include multibeam sonar systems and remotely operated vehicles equipped with digital underwater video cameras. These cameras can explore and map areas that can’t be reached by scuba divers. These maps will provide a basis for improved reef conservation and restoration for Buck Island Reef National Monument. They will also provide scientists with greater understanding of coral reef functions, allowing for improved management, conservation, and restoration of these irreplaceable natural resources. Buck Island Reef National Monument was established by Presidential proclamation in 1961, and expanded in 2001, in order to preserve "one of the finest marine gardens in the Caribbean Sea." Buck Island is six thousand feet long and a half mile wide and rises 328 feet above sea level. The island is made up of sedimentary rock layers deposited in deep water approximately 60 million years ago then pushed up and tilted. The island is uninhabited by people.